How did Monday get here so fast? And it was another gray and dreary day, overcast, cold and rainy – not pretty. Seriously, where’s our June weather? If the forecast tells the truth, it’ll be here later this week with plenty of sun and temps in the 80s – I can’t wait! No more mud pit for a backyard and maybe I can get a little gardening done! 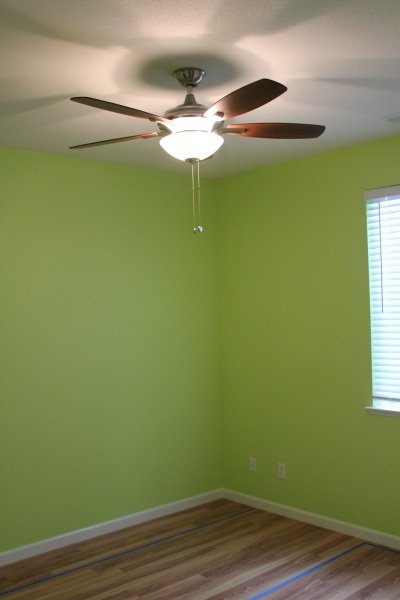 At least our office is nice and bright because the painting is done and new fan up. Like the color? It was a daring choice since all the other rooms in our house are white, but I decided the office needed something calming, but energetic. This shade is called Lime Mousse and I can almost smell the lime. :-) It only took a couple of weeks to get here from when I decided to strip our guest room, sell the furniture, and turn it into a sweet office for us. Not bad considering how busy our work schedules have been. But progress will be slow over the next week, we probably won’t finish the furniture for another week… or so. After such an icky day, I was craving something hot for dinner and quick. 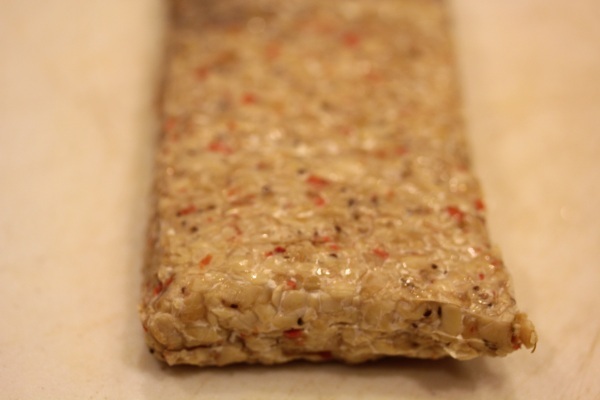 Good thing I have a fridge full of Lightlife tempeh because there’s not much else, I need to go shopping! 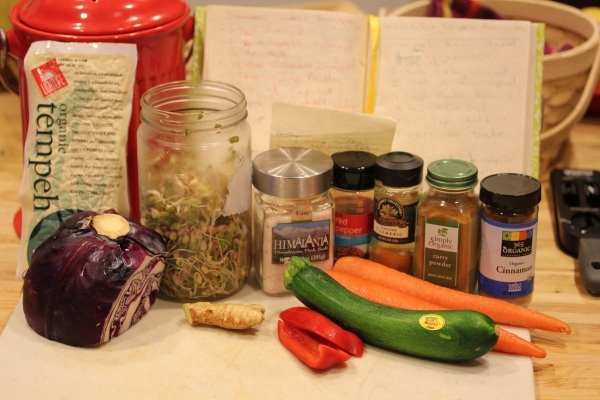 I grabbed the Garden Veggie flavor to try a new curry stir fry recipe with. Place all ingredients into a high speed blender and blend to a smooth texture. Pour over stir fry ingredients in wok and stir fry for about 5 minutes over medium high heat. Makes about 4 servings. I like the visible veggies chunks in the tempeh, it adds more flavor and texture compared to the plain tempeh I’ve used from Trader Joe’s. And the flavor is slightly sweeter with all the carrot chunks and worked great with the slightly sweet and savory curry sauce. 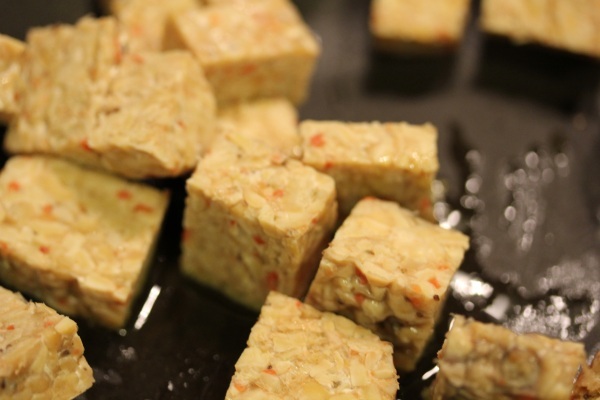 I chopped the tempeh into cubes and stir fried them alone with a little olive oil for about 5 minutes to cook and crisp the edges. Then I added sliced carrot, red cabbage, zucchini and red pepper, then stir fried for a couple minutes to soften the veggies. I added mung bean sprouts, then poured the curry sauce over the mixture in the wok and tossed over medium heat just enough to blend the sauce in, but not overcook the sprouts. 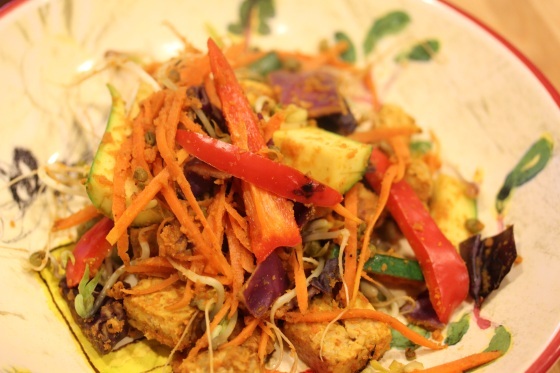 For a fast and lazy Monday night dinner, it was great adding a spicy and colorful kick to such a gray day. 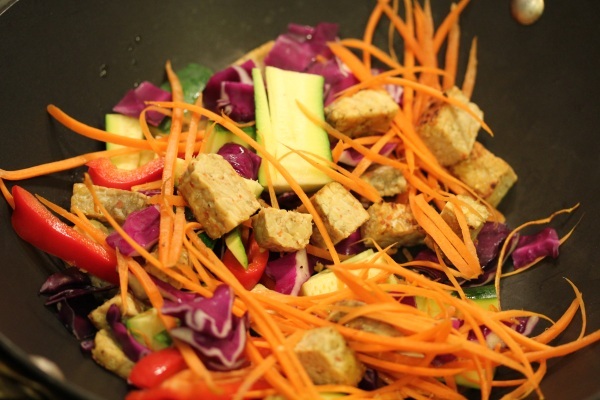 The tempeh worked very well in the stir fry with a slightly firm and nutty texture, but sweeter veggie flavor. 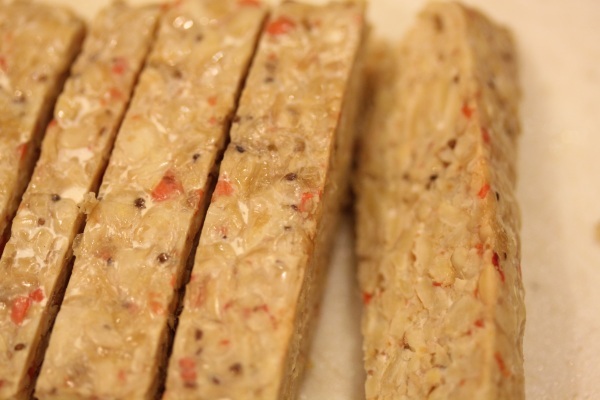 Tempeh is a perfect work night protein for me because it cooks so fast in stir fries, skillets, soups and even burgers – which I’ve gotta try next. “This shade is called Lime Mousse and I can almost smell the lime. :-) “– omg i LOVE THE COLOR!!!!!! I would have never picked that color on my own, to chicken to, but now that i see it, i love it and you totally made an awesome call! it looks stellar!! and your stir fry looks delish. Im not a curry fan but you make me wanna gobble it up anyway! Yikes– I think my comments are getting lost. Anyway, if this goes through– I LOVE the color!!!! Strange, they’re not going to spam – sorry about that! Thanks on the color, can’t wait to had the office set up with matching plants and lighting! 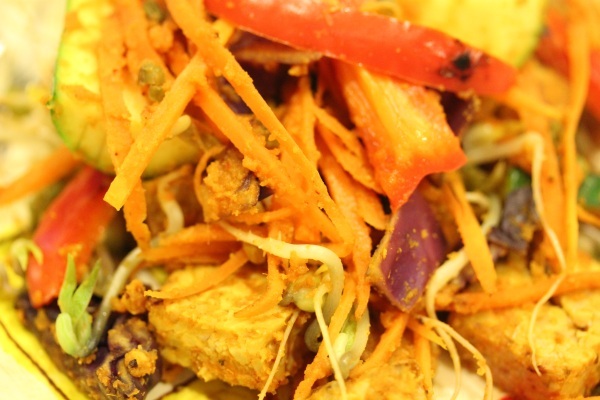 I love curry, but I’ve never had tempeh – how would you describe the flavor? The room color is fabulous! And the color of your salad is equally gorgeous! YUM! LOOOOOOOOOOOOOVE the green! like woah!